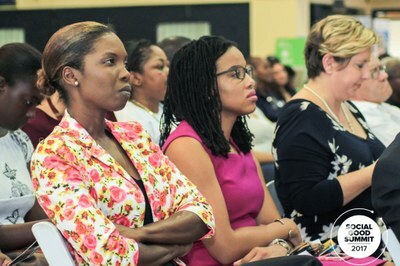 UTech Ja Hosts UNDP’s Social Good Summit 2017 — UTech, Ja. 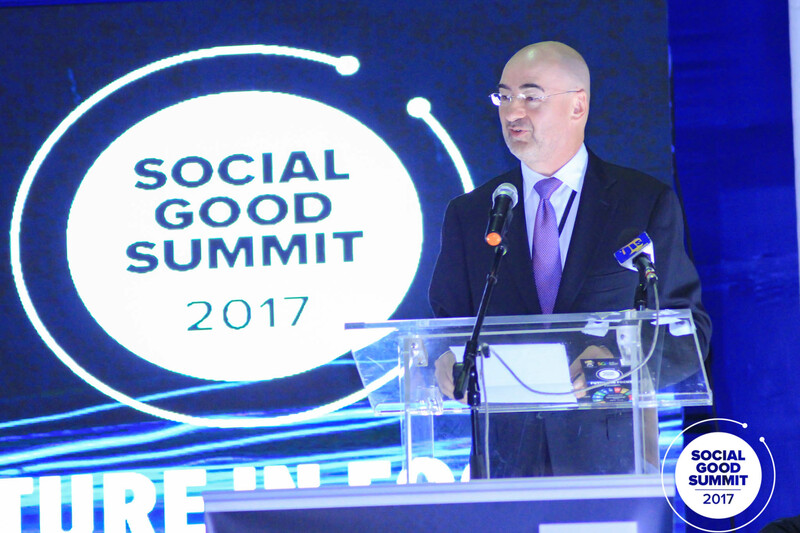 His Excellency Bruno Pouezat, UNDP Resident Representative delivers the opening address at the UNDP’s Social Good Summit hosted in partnership with UTech, Jamaica on Thursday, September 28, 2017 at the Alfred Sangster auditorium, Papine campus. 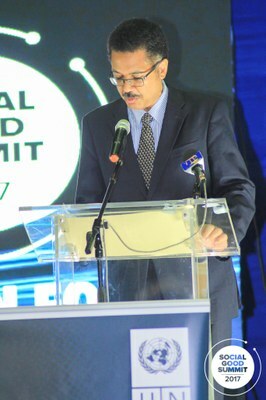 The University of Technology, Jamaica was proud host of The UNDP’s Social Good Summit 2017 held at the Alfred Sangster auditorium on September 28. The Social Good Summit is an annual conference organized by the United Nations Development Programme (UNDP) to examine the impact of technology and new media on social good initiatives around the world. Focusing on the theme, “We can unlock technology’s potential to make Jamaica a better place,” participants from government, public and private sectors, civil society, academia including university students and other youths through speeches, exhibitions and discussions sought to explore and initiate ways to increase awareness on the Social Development Goals among Jamaicans and on the impact of technology in development. Professor Stephen Vasciannie, President, delivering his keynote address to a rapt audience of guests drawn from the private and public sectors and academia. Senator the Hon. 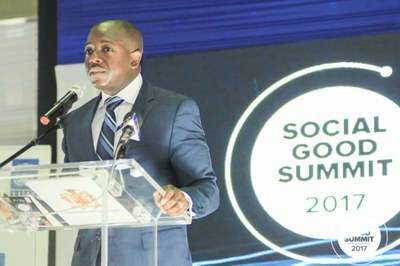 Pearnel Charles, Jr, State Minister, Ministry of National Security delivering his keynote address at the Social Good 2017 Summit. Minister Charles noted that technology presents both tremendous challenges and opportunities for development. He urged UTech, Jamaica to continue to emphasize technology literacy and usage as a means of advancing the attainment of sustainable goals. A panel discussion on the theme #2030 Now: Global Goals and the Technology that will Help Achieve Them” followed the opening ceremony. Panellists were Mrs Lisa Face-Shaw, Senior Lecturer, School of Computing and Information Technology, UTech, Ja., Mr Craig Perue, Research Fellow, University of the West Indies, Mona/PitchIT Training Manager, Mr Patrick Lafayette, Member, Board of Directors, Combined Disabilities Association, Miss Dainalyn Swaby, Miss Jamaica Festival Queen 2017, Mr Raymond Price, student – MSc., Sustainable Energy and Climate Change, Faculty of the Built Environment, UTech, Jamaica and Mr David Allen, President, Fletcher’s Land Management Benevolent Society. 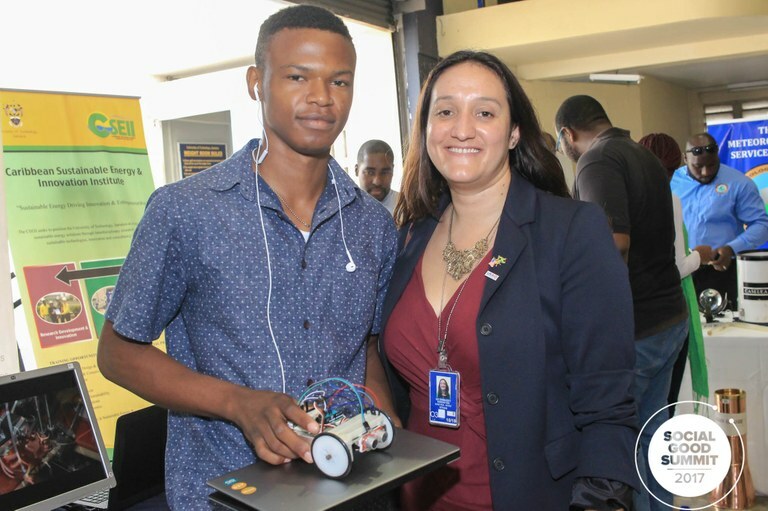 Mr. Romaine Gordon, Faculty of Engineering and Computing (FENC) student and one of the lead robotic system developers in the Institute of Electrical and Electronics Engineering (IEEE) UTech Jamaica Student Branch showcases his Obstacle Avoidance Robot to Ms. Kristina Otiz, Acting Public Affairs Officer, US Embassy. The robot is able to navigate its way in a room and avoid collisions with objects. It’s a flexible platform which can then be modified for several applications. Lecturer, FENC, Dr Dave Muir, a roboticist, IEEE senior member and lifelong advisor to the branch looks on. 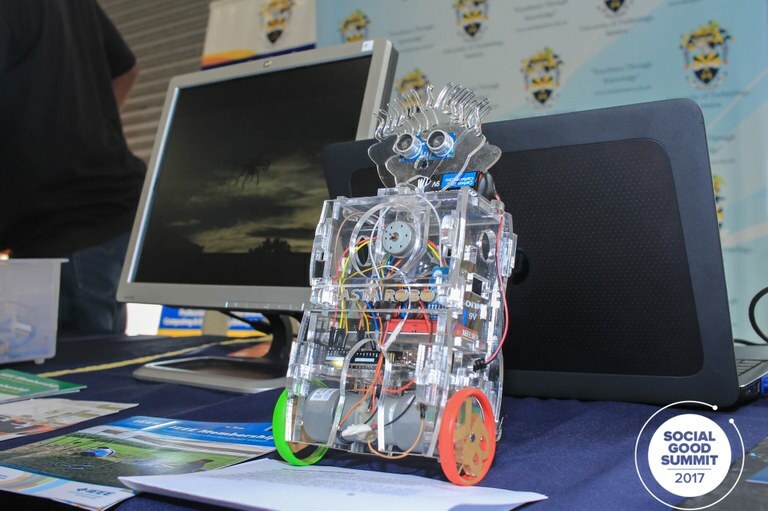 The robotics display formed part of the booth set up at the Social Good Summit by UTech, Jamaica showcasing technology and innovation. Also on display was the KB Robotics-Rasta Robot (below) created by FENC graduate, Mr. Kimroy Bailey. The ‘Rasta Robot’ is a training platform. It is able to move around, search for a flame and extinguish it. The basic setup can also utilize an app on any android device while the advanced setup is autonomous, enabling the robot to independently search for the flame, then extinguish it.